Expand your outdoor living space with a lasting, beautiful decking system by TimberTech®. Realizing TimberTech’s® waterproofing qualities, Keith Green Construction proudly installs a variety of their composite patio/decking systems. Eliminate the chore of maintaining traditional decking on a yearly basis with composite decking. Produced from high-quality raw materials combined with the protective power of UV-inhibiting color pigments. 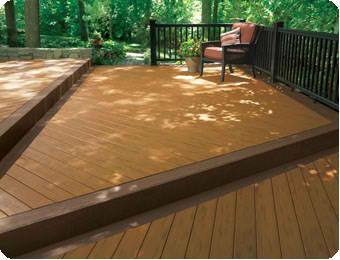 Composite decking keeps a consistent, beautiful color while retaining a powerful weatherproofing coating. Color pigment reflects excess heat, allowing fade and warp resistance. Designed with safety in mind, TimberTech deck systems resist splinting and slipping: perfect for children and the elderly. Find your home’s perfect system: XLM, Floorizon, TwinFinish, ValuPlank, Earthwood, and DockSider available.